Maritime pine (Pinus pinaster) is an important commercial species throughout its Atlantic distribution. With the anticipated increase in desiccation of its habitat as a result of climate change, the selection of genotypes with increased survival and growth capability under these conditions for breeding programs is of great interest for this species. We aimed to study the response to a realistic drought stress under controlled conditions, looked for a method to measure dehydration resistance, and analyzed dehydrin expression in drought-resistant and drought-sensitive clones from different ecotypes. 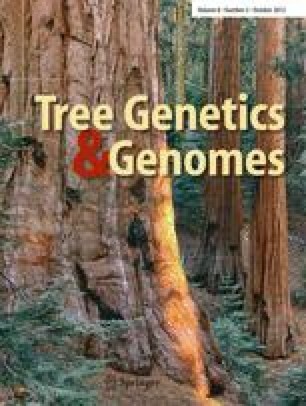 We report here the sequence characteristics and the expression patterns of five dehydrins from P. pinaster, along with the physiological characterization of drought stress responses in different genotypes (clonally replicated plants), originating from a broad geographical distribution across France and Spain (provenances). In total, we distinguished five different dehydrin genes in silico, grouped into two types—K2 and SKn. Three of the dehydrin genes had several sequence variants, differing by multiple or single amino acid substitutions. Only two of the dehydrins (PpinDhn3 and PpinDhn4) showed an increase in transcription with increased drought stress which was dependent on provenance and genotype, suggesting their involvement in drought resistance. The other dehydrins showed decreased expression trends with increased severity of the drought stress. The lack of close association between the drought stress and expression patterns of these dehydrin genes suggest that they could have other functions and not be involved in drought resistance. Our results suggest large differences in function between different dehydrin genes. The online version of this article (doi: 10.1007/s11295-012-0476-9) contains supplementary material, which is available to authorized users. This work was financially supported in part by the project “Heterogeneidad ambiental y adaptabilidad en respuesta a la sequía en colecciones clonales de Pinus pinaster”, Ref. RTA2007-00084-00-00. T. Velasco was granted an INIA scholarship, Ministerio de Educación y Ciencia of Spain. The authors would like to thank Antonio Fernández, Angelo K. Dantas (Servicio Regional de Investigación y Desarrollo Agroalimentario (SERIDA), Spain), and Inger Heldal (Skogoglandskap, Norway) for their valuable contributions and to Ronnie Lendrum who revised the English.